Up to this point, we have learned that the H&L 100 always mixes and prepares a fresh milk diet, at the right temperature, for each individual calf. And of course the H&L 100 automatically cleans all tubes and hoses. However: To date, the area where the calf drinks the milk has been gravely neglected when conventional automatic feeders are used. That is why many veterinarians are concerned that the teats on automatic feeders harbour the risk of transmitting diseases. This is where the HygieneStation from Holm & Laue sets THE new standard, not only in terms of hygiene, but also when it comes to making work easier. Do you know where the highest level of bacteria and germs are in the calf pen? Right! The place where all the calves access and drink the milk several times a day. Now, the HygieneStation ensures that the area is kept clean. In the new HygieneStation, the outside of the teat is pressure cleaned with fresh water after every visit. The germ and bacterial load on the teat is thus reduced by up to 80%! Every calf produces mucus when they drink. With the HygieneStation, this is collected in a mucus bowl together with the teat cleaning water and washed away after each feeding process. As a result, the entire feeding area stays hygienically clean and dry. The teat at the feeding station is positioned so that it slants downwards in a similar way to the teats on the suckler cow. This encourages the natural drinking position of the calf. When the head is stretched, it encourages the natural reflex of the oesophageal groove and reduces the risk of milk passing into the rumen. Practice has shown that calves can orientate better when the teat is illuminated. This increases the intake of milk during the night and the feeding process is evenly distributed over 24 hours. For many farmers, a lower workload is an argument in favour of the automatic feeder. The new HygieneStation now makes the rest of the work considerably easier as well. As soon as a calf lifts the teat, a small amount of milk flows into its mouth. This stimulates the calf's initial drinking impulse; manual teaching is only necessary in exceptional cases. Nevertheless, if manual learning is required, milk can be fed into the teat by pressing a button. Many feeding stations are located right in the calf pens. 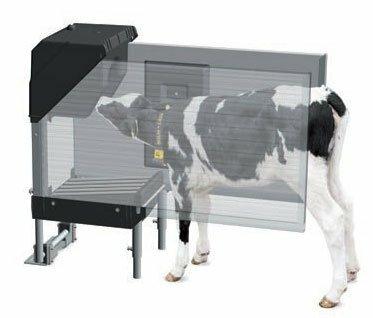 For cleaning, the new HygieneStation can be tipped forward at a 90° angle, so that the whole area can be easily and conveniently mucked out with a tractor. The teat can easily be changed in seconds by using the quick-release handle. All components can be reached at a comfortable working height. This facilitates monitoring, inspection and maintenance tasks. Parts that are relevant for maintenance are highlighted in yellow. The design of the station also allows it to be placed in a natural-climate outdoor pen, because all of the parts are frost-proof. * Technical specifications subject to change!